1. We may not agree about the meaning of evolution. For example, when it is used loosely in everyday language, ‘evolution’ tends to refer to a very long term, gradual process of change. However, evolution can also refer to the idea of ‘punctuated equilibrium’ in which long spells of gradual change are interrupted by relatively short but profound bursts of activity and change. Consequently, the study of evolution is instantly confusing because it can refer to the *opposite of* and/ or the *same thing as* revolution. There are also some other sources of potential confusion about, for example, the nature of evolution (does it necessarily refer to advancement?) and the nature of ‘selection’ (do species simply respond blindly to their environments or help create them?). 2. Some people have really ruined evolution for the rest of us. We can blame so-called ‘social-Darwinism’ for the racist/ sexist idea that some people are more evolved than others. In other words, ‘evolution’ comes with a lot of baggage when we apply it to social science discussions. the coming together of multiple factors to create the conditions for major policy change (which can be a creative, ‘window of opportunity’ style process, or a destructive, failure-related ‘perfect storm style process). This range of understandings may not put us off evolutionary discussions completely, but it shows us that we should be super-clear about our meaning of evolution when we seek to make these sorts of comparisons with evolution in nature. 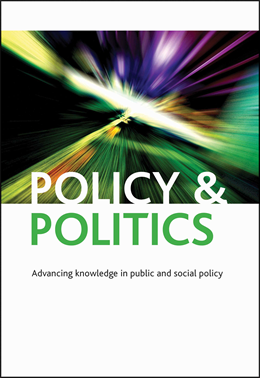 Multiple Streams Analysis (Kingdon) – uses the term ‘policy primeval soup’ to suggest that, although policymaker attention may lurch from one problem to another, problems will not be addressed until policy solutions have evolved sufficiently within a policy community and policymakers have the motive and opportunity to adopt them. ‘Evolution’ describes the *slow progress* of an idea towards acceptability within the policy community. Punctuated Equilibrium theory (Baumgartner and Jones) – suggests that that ‘incremental’ policy change in most cases is accompanied by ‘seismic’ change in a small number of cases – an outcome consistent with ‘power laws’ found in the natural and social worlds. Kingdon’s picture of slow progress producing partial mutations is replaced by Baumgartner and Jones’ *fast, disruptive, pure mutation* (in some cases). Institutions, as sets of rules and norms, represent ways for people to retain certain ideas and encourage particular forms of behaviours. Complex systems represent (partly) a large number of overlapping and often interdependent institutions. New behaviours and rules arise from the interaction between multiple institutions and the actors involved. In other words, different ‘worlds’ are in constant collision, producing new ways of thinking and behaviour that ‘emerge’ from these interactions. They are then passed down through the generations, but in an imperfect way, allowing new forms of thinking and behaviour to emerge. The equivalent of passing on genes is passing on ‘memes’, or ideas (beliefs, ways of thinking – as described in the 70s by Richard Dawkins before he moved onto God). ‘Variation’ refers to the different rules adopted by different social groups to foster the collective action required to survive. ‘Selection’ describes the interaction between people and their environments; particular environments may provide an advantage to some groups over others and encourage certain behaviours (or, at least, some groups may respond by adapting their behaviour to their environment). ‘Retention’ describes the ways in which people pass on their genes (memes) to ensure the reproduction of their established rules (we might call them ‘institutions’). The key difference in the study of evolution and policymaking is the idea of passing on memes through the generations. We think of passing on genes through the generations as a process that takes hundreds, thousands or millions of years. Passing on memes through the ‘policy generations’ is more like the study of fruit flies (months), viruses or bacteria (days or weeks). In other words, ways of thinking, and emerging behaviour, change constantly as people interact with each other, articulating different beliefs and rules and producing new forms of thinking, rules and behaviour as they interact. Big jumps in ways of thinking may be associated with key generational shifts, but that can take place, for example, as one generation of scientists retires or, more quickly still, one generation of experts is replaced (within government circles) by another. Complexity theory may be used to capture, describe and explain that sort of interaction on a grand scale. We can zoom in to see individuals interacting with each other, or zoom out to observe mass behaviour and the sorts of outcomes that emerge from them. For me, this means that the field is wide open when it comes down to research methods. If we are interested in people understanding this complex process of interaction, we can study those individuals using interviews and/ or various forms of observation. If we are interested in the whole system, we might adopt mathematical models and computer simulations. There is nothing to stop us combining such methods (and more) if we avoid the sort of people that adhere slavishly to one fixed understanding of the world and, therefore, one method to help us understand it. I don’t hold out much hope of this sort of discussion capturing the public imagination. However, the chances are that this sort of discussion of evolution (and its relationship to complexity theory) is taking place in a wide range of disciplines without much exchange between them. So, if you see a blog like this written by someone else in some other field, please let me know. Cairney, P. (2013). What is evolutionary theory and how does it inform policy studies?. Policy & Politics, 41(2), 279-298.